We’re not going to lie. These did not turn out like we had planned. 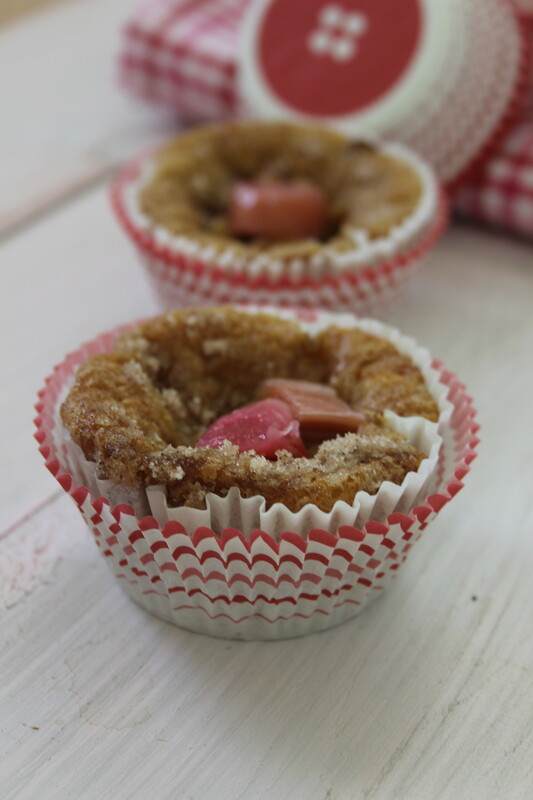 We pictured beautiful fluffy muffins with creamy centers. Instead we got a sunken middles and an oozy centers. Keeping the glass half full…we went with it and ended up with a really delicious soft muffins with a stuffed centers. 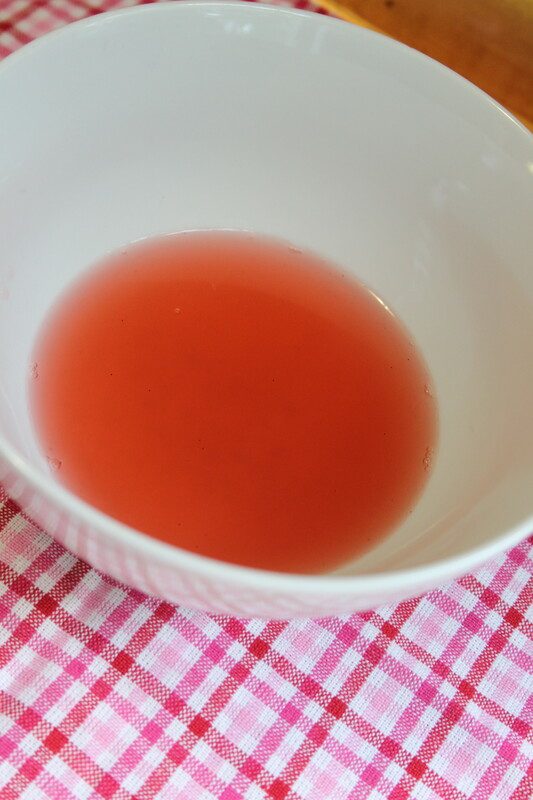 We started with our rhubarb which we put into a bowl and then separated, reserving the juice for later. 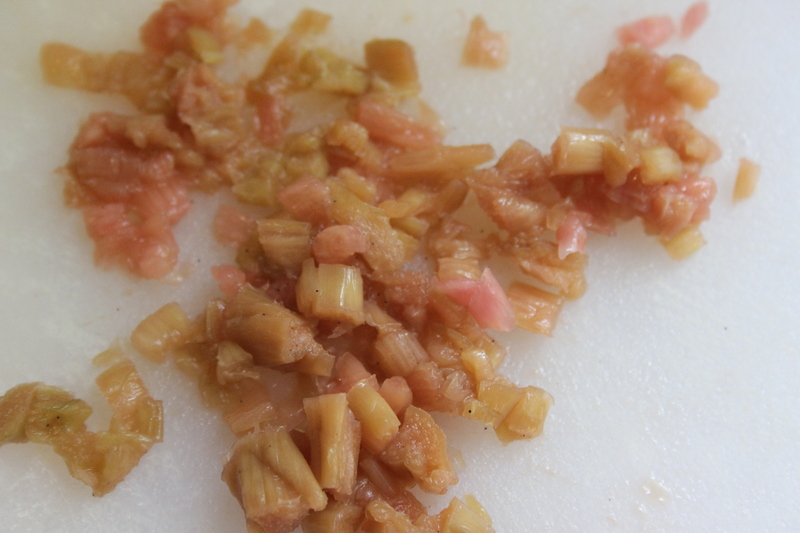 The remaining rhubarb was diced and some of the pinker pieces were reserved for garnish but later was ultimately used for stuffing the muffin. 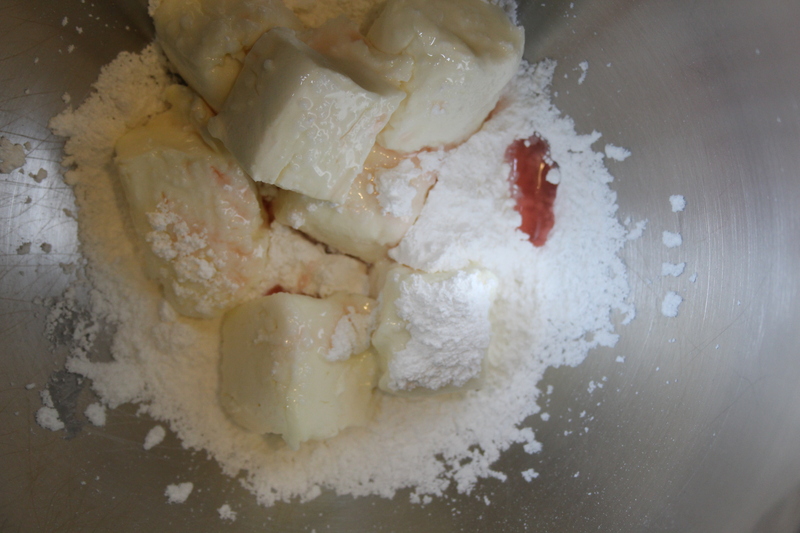 We took one package of cream cheese, 1/3 cup of powdered sugar and some of the rhubarb juice and mixed it until combined. 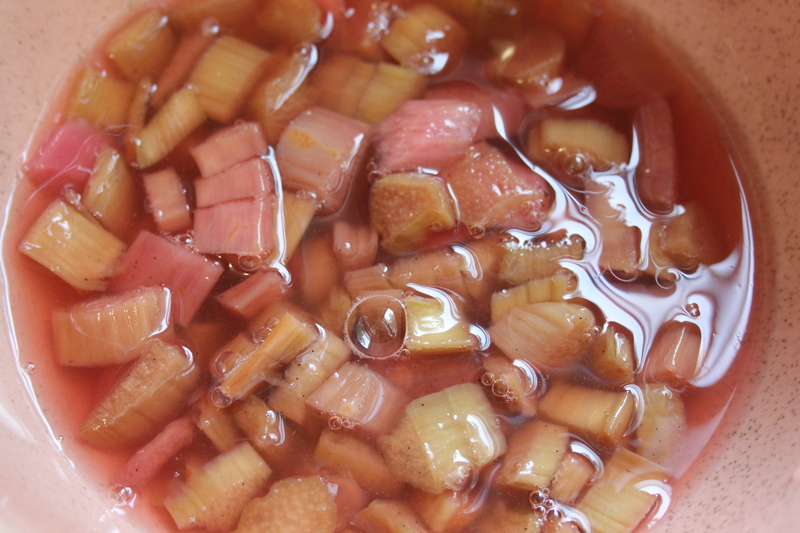 We added in the diced rhubarb and mixed. 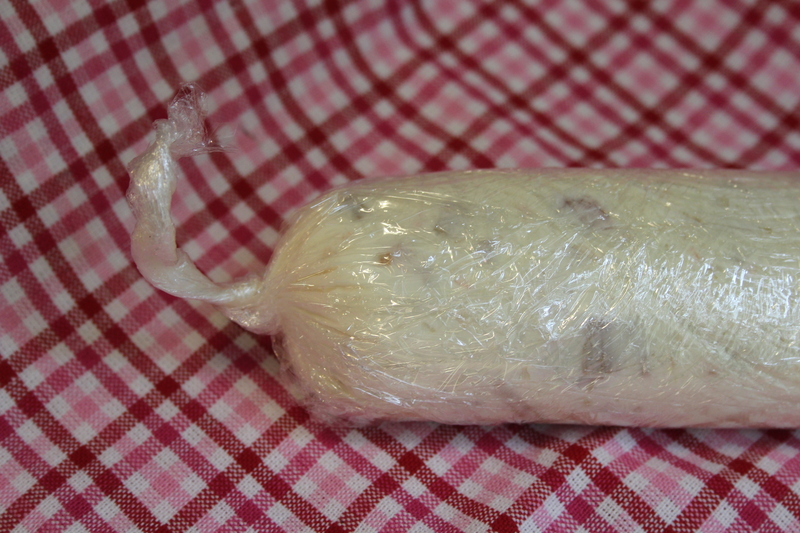 The soft mixture was then rolled into a log and put in the freezer for about an hour to firm up. It did not freeze, just got a little easier to work with. 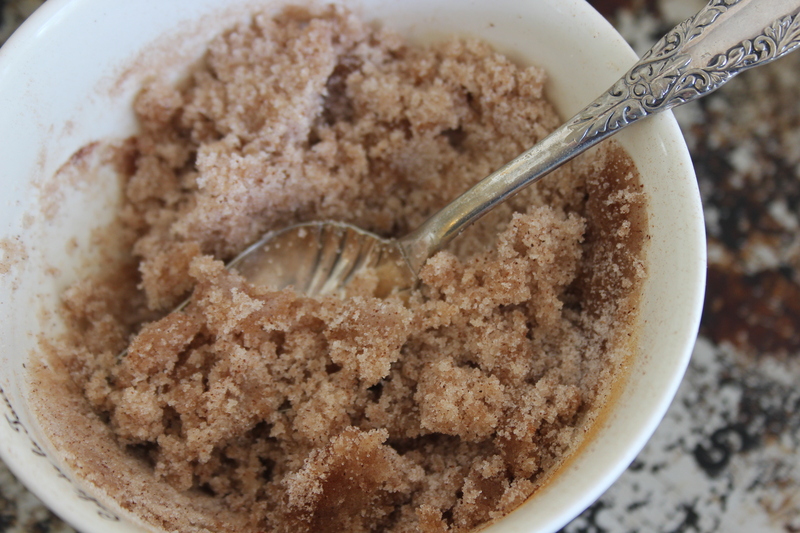 While we waited we mixed 2 1/2 cups flour, 1 teaspoon baking powder, 1 teaspoon baking soda, 1 teaspoon salt and set aside. In our mixer we added 1 1/4 cups brown sugar, 1/2 cup vegetable oil, 1 slightly beaten egg, 1 teaspoon vanilla paste and 1 cup of buttermilk. We added the dry to the wet and mixed. 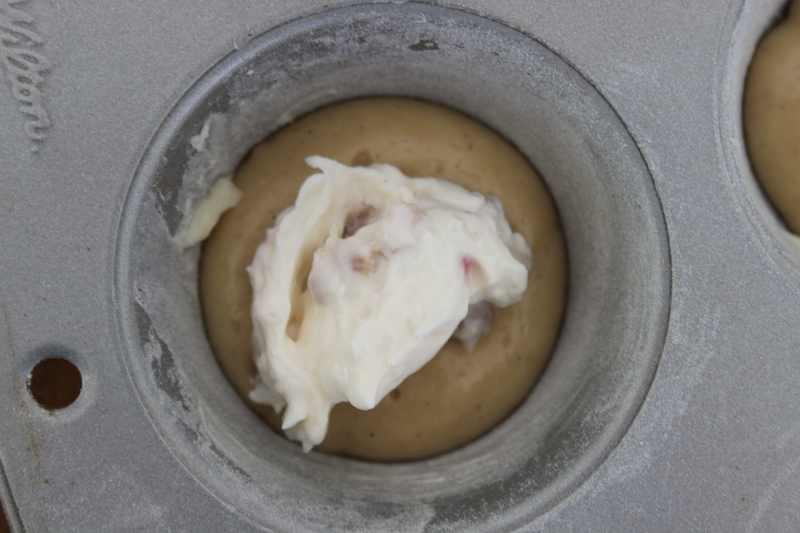 The batter reminded us of an apple cake batter we have great success with. It was a little sticky and taffy-like but fluid. At this point we still did not know these would not turn out like we had hoped. 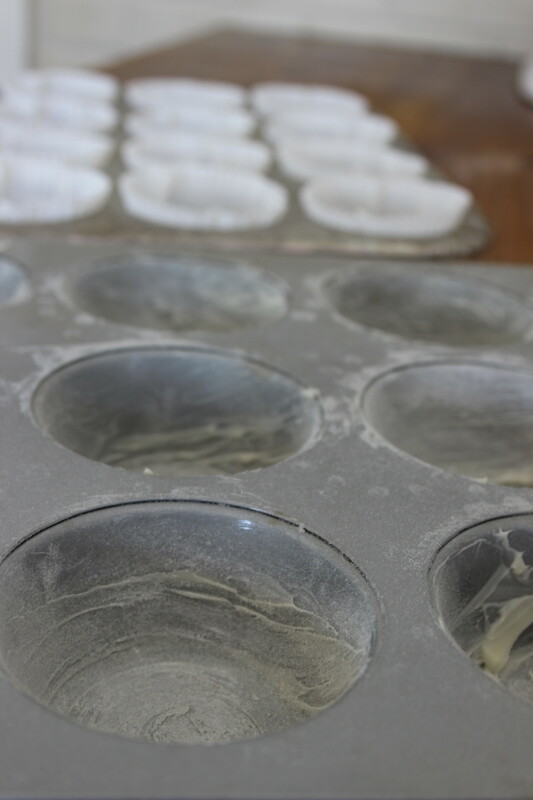 We greased and floured a muffin tin but also did one tray with paper liners. 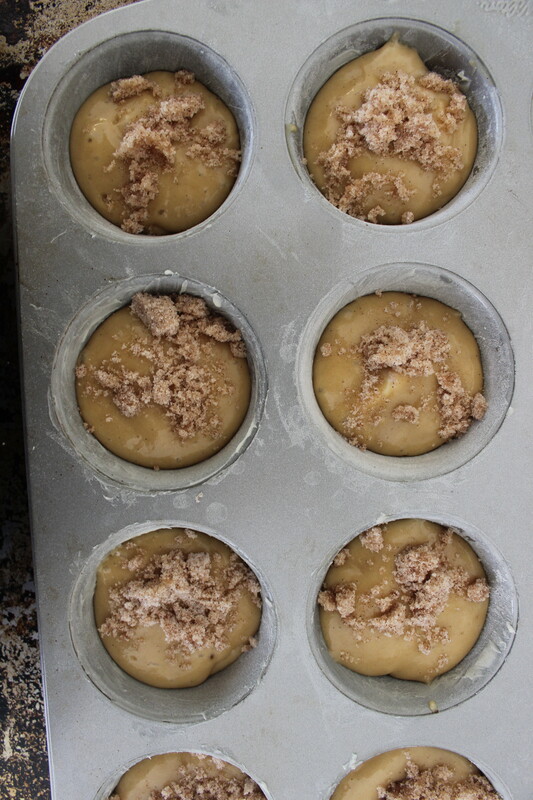 In the end the tray with the paper liners held the batter better but were harder to get the muffin out of. 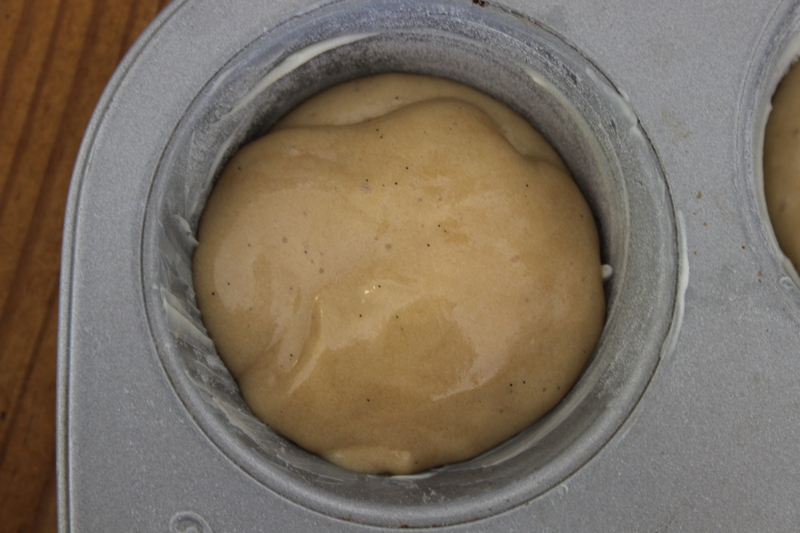 The tray that had been buttered and floured just needed longer to cool. 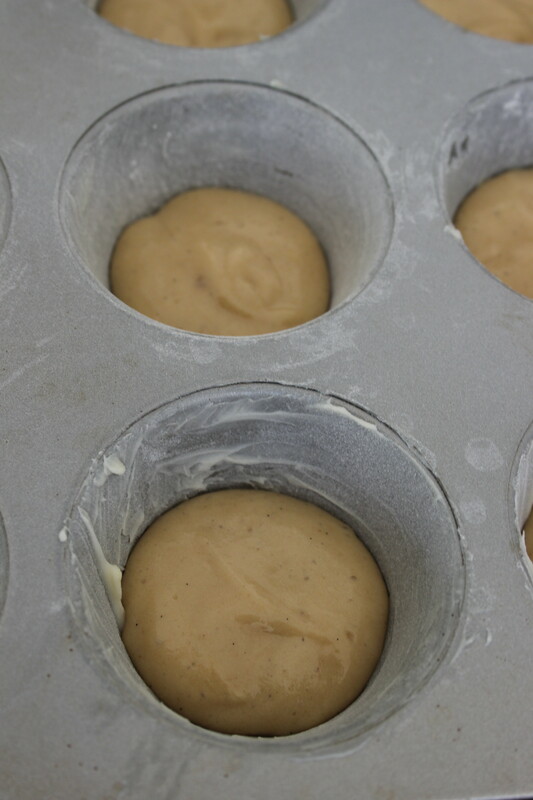 The muffin tins were given one small spoonful of batter, then a slice of the cream cheese mixture, then another spoonful of batter on top. It is really important not to fill the tins too high. 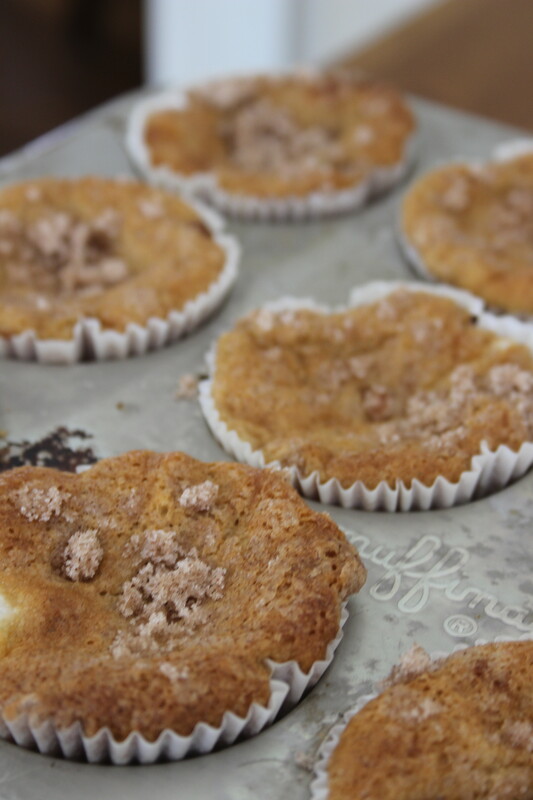 The muffins were topped with a crumble like mixture which was made by using 1 tablespoon of melted butter, a 1/4 cup of sugar and a touch of cinnamon. This was then sprinkled on the tops of the muffins and they were then baked for 25-30 minutes at 350 f.
When these came out of the oven we could tell the centers had sunk. 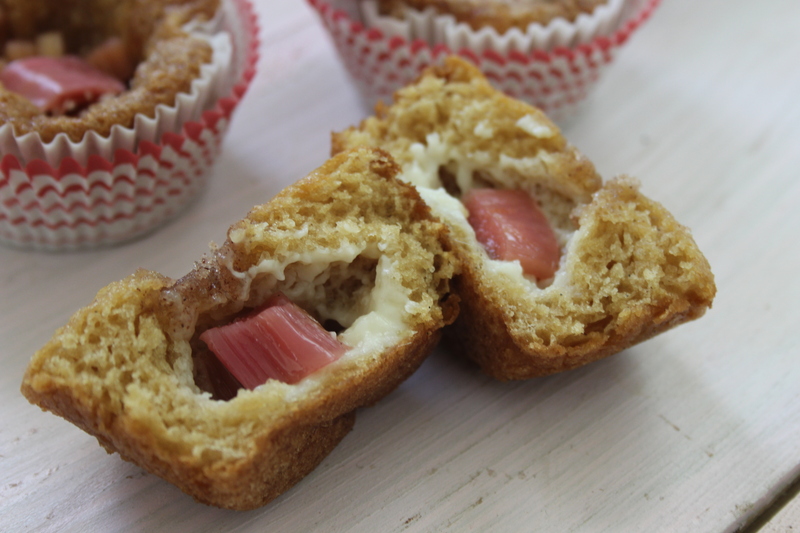 We decided this was a great opportunity to stuff the muffin with the rhubarb we had reserved at the beginning. 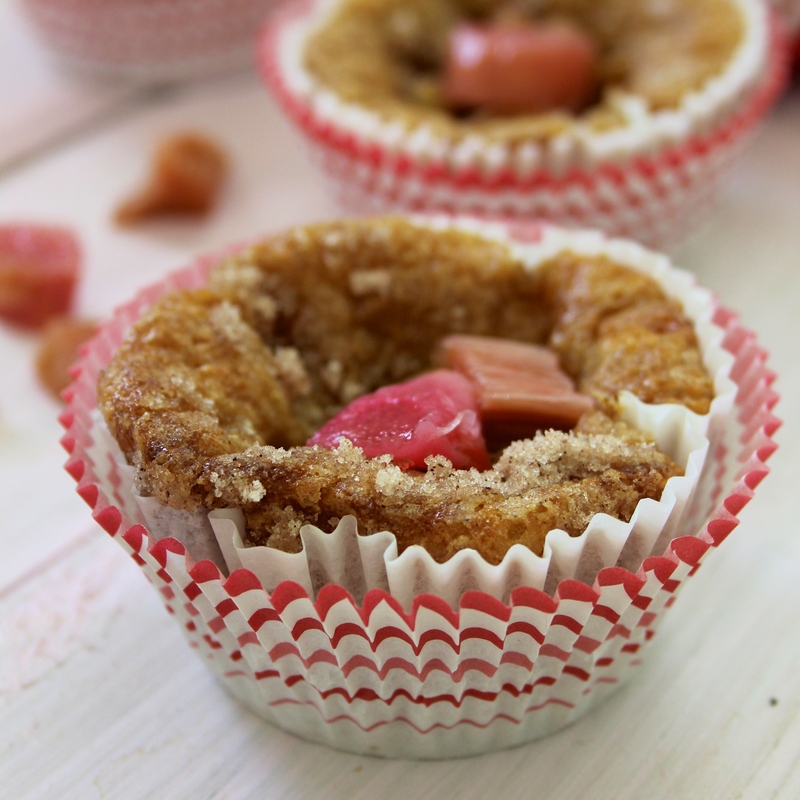 We gently took the pink pieces and set them into the centers of the muffins. Despite our sunken centers, we loved these muffins. 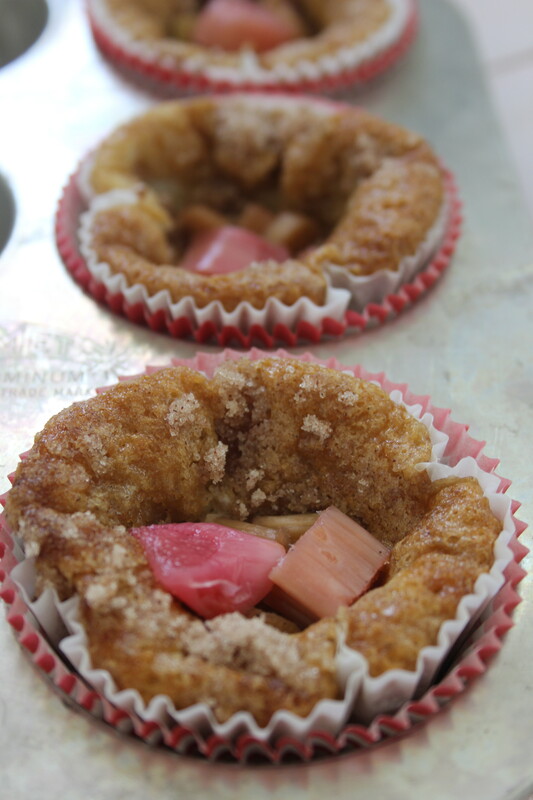 Not only were they pretty, they were moist, sweet from the cream cheese and crumble topping and tart from the rhubarb. They didn’t last long. Just to figure out what went wrong we probably will make them again and substitute butter for the oil. We will let you know how they turn out!